Our last day in SA. we just hung around the coach and got ready to leave then pulled out around 9:45 on Wednesday morning to head west on I-10 to Fort Stockton, TX. The road was generally good with a few minor rough patches and several miles of widening construction west of San Antonio. The drive across Texas was interesting as we went from the hill country to flatter ground and marveled as the plant life got progressively shorter as we moved into drier country. We pulled into the Ft. Stockton RV Park about 3:30 and were assigned site 52, a long pull through allowing the car to remain hooked up. We only used the electric, cable TV and WiFi and they all worked very well. During the drive, we had been discussing what we had in the fridge for supper then we got the campground literature, discovered they had an on-site café, and saw they advertised World Class Chicken Fried Steak which left us with a no-brainer decision to make as we all love it. So we moseyed over to the café (attached to the office) and all ordered the CFS – mine with white gravy on it and theirs with brown gravy on the side. It came with green beans, mashed potatoes, and a biscuit. The CFS was one of the best we’ve eaten with tender, gristle free meat, well seasoning, and a crispy coating, the beans were cooked the way I like them, the mashed potatoes were real and the biscuit was outstanding. After it easily parted in the middle, we decided that these tall beauties were in fact two biscuits cooked on top of one another and we ordered six more to go. I told the cook that if I lived in the area, I would sneak into the campground just for their biscuits. The next morning, I went back for a breakfast of eggs, sausage, hash browns and, of course, another biscuit, all of which were very good and I took two hot biscuits home to the girls. We left Ft. Stockton about 10:30 am for the run over to our next stop at Las Cruces, NM. It was an uneventful 285 mile trip with pretty good road surface on I-10 except for a few rough spots. The terrain got progressively more desert-like and for the life of me, I can’t understand why the white men fought the Indians over this land – oil hadn’t been discovered there yet. One of the pluses for the trip was good for a rail fan - a Union Pacific main line ran beside I-10 and we were treated to several trains all full of shipping containers heading east, along with the heavy traffic of semis on I-10. 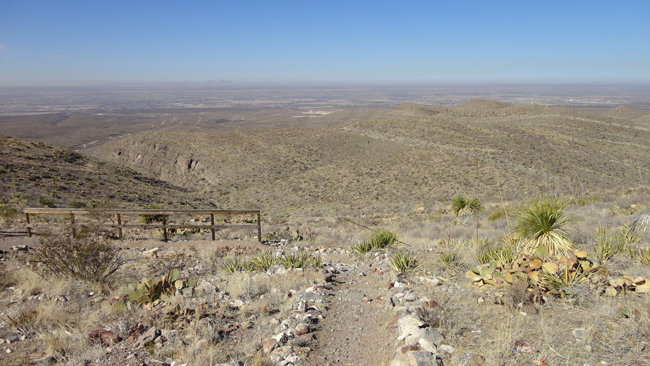 We took I-10 to the east side of El Paso then US-395 around town which required an 8% grade over the hills of the Franklin Mountains State Part before returning to I-10 – very little traffic and no issues with the hills. We pulled into Hacienda RV Resort in Las Cruces about 3pm local time, got set up, and just relaxed for the evening. That drive along I-10 we find is always and easy one that we have done more time than I can remember.Always a love the changing scenery as we reach the southwest. Don't you just love it when you get a meal like that ... that meets your expectations and more. Smart to get some of those biscuits to go. I think I would have carted out a container or two of gravy also. Look forward to your next post. Las Cruces to Tucson scenery didn't change much did it. :) I remember how thrilled I was when we got closer to Tucson and screamed - "there's a Saguaro", when we finally saw vegetation over two feet tall. I love stumbling upon tasty grub - the chicken fried steak looks AMAZING and those biscuits are making my mouth water. So glad you are having a fun trip.